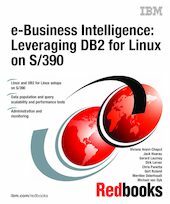 This IBM Redbooks publication discusses leveraging DB2 for Linux on S/390 for new e-BI opportunities. It shows the possible Linux configurations on S/390 and describes the advantages of consolidating UNIX data mart farms on unique IBM eServers using DB2 for Linux on S/390. The book describes how to set up DB2 for Linux in a Linux LPAR and how to customize the database connections (using DB2 Connect for Linux) to the DB2 for OS/390 data warehouse residing in an OS/390 LPAR on the same machine. It also includes early scalability and performance tests on queries and data population techniques run at the IBM S/390 Teraplex Center in Poughkeepsie, New York.